"Armstrong is ambitious. 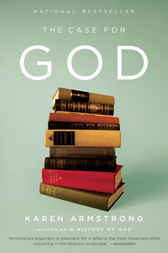 The Case for God is an entire semester at college packed into a single book—a voluminous, dizzying intellectual history. . . . Reading The Case for God, I felt smarter. . . . A stimulating, hopeful work. After I finished it, I felt inspired, I stopped, and I looked up at the stars again. And I wondered what could be." —Susan Jane Gilman, NPR's "All Things Considered"
Karen Armstrong is the author of numerous books on religion, including Fields of Blood, A History of God, The Battle for God, Holy War, Islam, Buddha, and Fields of Bloos, as well as a memoir, The Spiral Staircase. Her work has been translated into forty-five languages. In 2008 she was awarded the TED Prize and began working with TED on the Charter for Compassion, created online by the general public, crafted by leading thinkers in Judaism, Christianity, Islam, Hinduism, Buddhism, and Confucianism. It was launched globally in the fall of 2009. Also in 2008, she was awarded the Franklin D. Roosevelt Four Freedoms Medal. In 2013, she received the British Academy’s inaugural Nayef Al-Rodhan Prize for Transcultural Understanding.